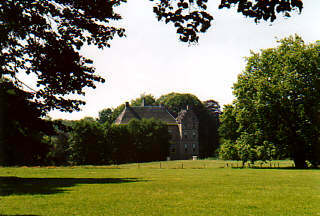 The name "Achterhoek" implies a region which lies in a remote area of the country. And yes, it is quite some distance to travel from the big cities in the west of the Netherlands. However, most people think more of it as a retarded area than of a remote area. We found out this is nonsense, it is a beautiful place with nice people, great houses and wonderful nature. We went walking for a few days and saw a lot of beautiful places. 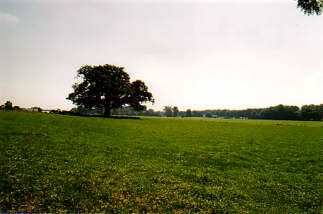 The Achterhoek borders at Germany. At small roads there are signs to warn you not to cross the border at night, by car, without proper documents or in possession of goods which you may not take over the border. At the bigger road there is only a sign to tell the speed limits and to welcome you. 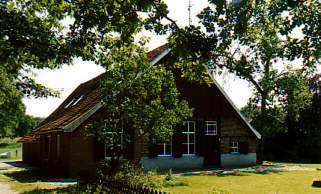 A typical farm in the Achterhoek. It has only one building in which the house itself and the barn is. Experts can see by the painting of the shutters whether it is a free farmer or someone who rents his farm from one of the country-seats. 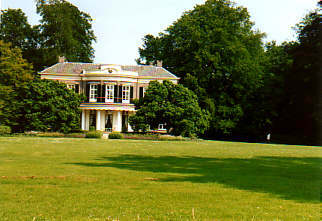 In the Achterhoek, as well as the rest of the province Gelderland, are a lot of country-seats. In early times, the noblemen needed a lot of money for the war. Gelderland had a lot of rich farmers. The noblemen gave the farmers a title and some rights, and got the money in return. In the vicinity of Vorden are nine country-seats or castles. All of them are beautifully located in meadows and forests, places without neighbors. 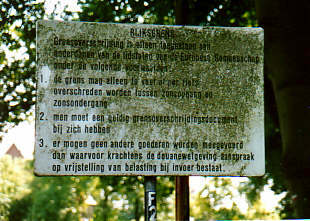 Some of them are still private property, but most are owned by a nature organization such as Geldersch landschap, Natuurmonumenten or Staatsbosbeheer. Between the trees you can see the dovecot. Noblemen had the right to keep (and eat) pigeons. Of course you don't want your dovecot right next to your bedroom, you would go mad of the noise of the birds. But with a place of several tens of thousands of square meters, you can easily put it in the middle of nowhere. This oak tree is supposed to be several hundreds of years old. 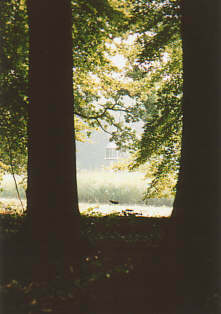 The outline of the trunk is seven meters. Funny thing is, we have seen in those few days in the Achterhoek a lot more of trees as big as this one, although we didn't get the numbers of those trees.